The Mi Max certainly feels like a first attempt at what is largely unchartered territory for Xiaomi. While it has undercut the competition in price, it has also cut corners in many areas: the device's cheap build quality, poor imported device software experience, and lack U.S. availability are clearly disappointing attributes. But no smartphone is perfect, and the Mi Max has plenty to offer for the price. Its impressive camera, excellent battery life, and smooth performance are all great reasons to buy this phone. So how well does the Mi Max deliver on that promise? Let’s find out with our written review of the Xiaomi Mi Max! The extra-large 6.44″ 1080P display on the Xiaomi Mi Max places this phone well into phablet territory. When I fist started using the Mi Max, I had mostly mixed feelings. On the one hand, I immediately enjoyed the extra screen real estate for videos, but on the other, I worried how feasible it would be to use the Mi Max day-to-day. While it is possible to sometimes use the Mi Max with a single hand, it can get very uncomfortable very quickly. Once you are subconsciously accustomed to the Mi Max’s size, however, it seems much more normal in the hand. Still, its size does tend to make it slide out of many non-jean pockets, which is definitely annoying. Whether the extra-large size is the best fit for you will depend both on your usage and your willingness to change how you interact with your smartphone. For me, the transition to the Mi Max wasn’t difficult, but I will still be returning to my slightly smaller Nexus 6P, for its practicality. The display itself looks pretty good; it has good viewing angles and accurate color reproduction. The 1080P resolution seems a bit low at this size, and I would have liked to see Quad HD, even if it meant for a slightly higher price. Sunlight readability could use some work, and while the reduced contrast sunlight mode does help, the screen on the Mi Max can still be difficult to read outdoors. With that said, kudos to Xiaomi for including Corning Gorilla Glass 4, something that we don’t often see at this price point. The Qualcomm Snapdragon 652 processor strikes yet again in the Xiaomi Mi Max, and helps make the Mi Max performance comparable to phones with higher-end chips like the Snapdragon 808. MIUI, Xiaomi’s custom software, runs very smoothly on the Mi Max, and the base model’s 3 GB of RAM is generally enough for moderate-to-heavy multitasking. It is important to understand that there are different models available as well, although we do not imagine real-world performance differences between models to be significant. I also had no trouble playing higher-end games like Asphalt 8, thanks to the phone’s Adreno 510 GPU. The Xiaomi Mi Max offers great call quality, and if you chose to use the device in an official market, you’ll receive 4G LTE speeds. However, if you’re in an unofficial market, like the United States, you’ll be limited to HSPA+ speeds on both AT&T and T-Mobile. That’s quite unfortunate, but it’s worth noting that the Mi Max is an unlocked dual-SIM device, and one of the SIM slots doubles as a microSD card expansion slot, allowing you to expand the phone’s storage up to 256 GB. The fingerprint reader on the back of the Mi Max is accurate and, in my experience, just a hair faster than the one found on the Nexus 6P. That’s pretty good for the price, and many users will appreciate the added convenience when securing their phones. What did strike me as odd was Xiaomi’s retreat to microUSB, the now outdated data and charging port standard. While some, like Samsung, have decided to allow USB Type-C to mature before implementing it, Xiaomi embraced it just months ago with phones like the Mi 5, so their inclusion of microUSB now feels like a step backwards more than anything else. With that said, microUSB may still be appealing to those who are still using the older standard and do not want to purchase brand new cables. The single side-firing speaker on the Mi Max sounded pretty good in my testing, and sounded only slightly distorted at high volumes. While it would have been great to see front-facing speakers for an even more immersive media consumption experience, they would have likely added to the size of the phone. Therefore, a side-firing speaker seems to be a nice compromise in this case. Battery life with the Mi Max was excellent in my testing, thanks to its very large 4850mAh non-removable battery. 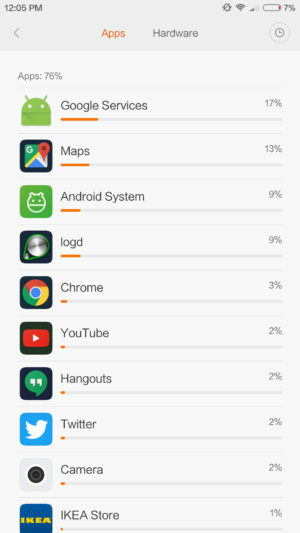 Screen on time did vary considerably depending on my usage. Primarily, I noticed that it did significantly better on Wi-Fi than it did cellular data, but even my heaviest usage was not enough to kill the Mi Max in a single day. While it does support Qualcomm Quick Charge 3.0, Xiaomi has failed to include a Quick Charge 3.0 charger in the box. This was more acceptable even with the more expensive Mi 5, as the charge times still weren’t so bad even on Quick Charge 2.0. But with the Mi Max, the battery is much larger, and therefore takes about four hours to charge…on Quick Charge 2.0! Basically, a Quick Charge 3.0 charger is necessary here, and it’s a shame that Xiaomi is requiring users to purchase one separately. The Xiaomi Mi Max is equipped with a very capable 16 MP f/2.0 rear camera with a dual-LED flash. After taking a closer look at the sample images, it seems that the Mi Max’s camera is one of the best we’ve seen at this price point. Images came out sharp and detailed with visually pleasing color reproduction and great dynamic range. The Mi Max’s camera is far from perfect, however. Autofocus is remarkably slow and finicky and, even when holding the device and subject still, the Mi Max would slightly miss focus more than what we normally expect. It also tended to oversharpen images, to the point of recognition in some images. Just as is the case with virtually all sub-$250 smartphones, low-light is where the camera truly struggles. While it is possible to get a good image with the Mi Max in a darker environment, it simply can’t be counted out on like some other smartphone cameras can. That’s not a major flaw because of the phone’s price, but it is something to keep in mind. MIUI’s camera app remains easy-to-use while also offering manual control for those who wish to take advantage of it. The built-in filters are nice to play around with, and the different modes like Panorama can be very helpful in some situations. Xiaomi has shipped the Mi Max with its own custom version of Android, MIUI 7. Although it is running on top of Android 6.0 Marshmallow, MIUI is a sharp departure from stock Android. And while I do generally enjoy using MIUI 7, I’m looking forward to the production release of MIUI 8, which will bring a great number of UI changes and improvements. At the time of writing, Xiaomi had just begun automatically rolling out MIUI 8 for those on the beta release channel. Normal users can expect the update in the coming weeks. Since this phone is still shipping with MIUI 7, this part of the review will focus on the MIUI 7 software experience. MIUI has received a number of mixed reviews from Western media, with some criticizing it for being too similar to iOS, and with others praising it for the amount of polish and coherency it offers. After using MIUI day-to-day myself, I think it’s a great alternative to stock Android, especially for users who wish to customize and tweak. The stock apps are well designed, the UI is remarkably responsive, and the ability to do things like restrict data for specific apps is invaluable. To top it off, the MIUI receives weekly updates, so you’ll be getting bug fixes and new features very often. With all of that said, the software experience for those importing the device is far from perfect. Reseller loaded bloatware, a hellish bootloader unlocking process, and missing Google apps are major hurdles that importers will face. Even if you do get Google apps up and running with the installer app from the Mi App Store, there are still issues to be had. Random Google app crashes, Google Now issues, failure to place calls with Google Voice, and the inability to do things like consume DRM-protected content can make this experience less than ideal for Westerners.